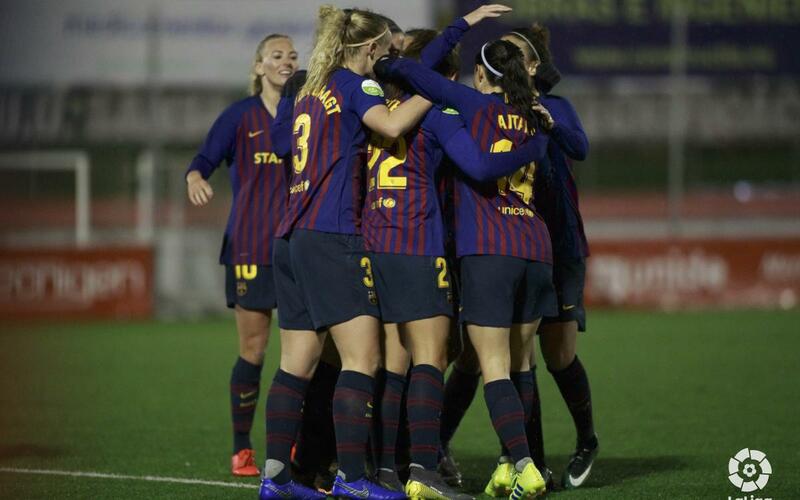 The Barça women are through to the semi-finals of the Copa de la Reina thanks to a 3-0 win at Madrid CFF with goals from Lieke Martens, Marta Torrejón and Kheira Hamraoui. It was a game in which the Catalans certainly didn’t have everything their own way, but most of the big chances were theirs and they knew how to make the most of them. Martens’ opener came on the end of a fine piece of teamwork, with Andressa Alves providing the assist 12 minutes into the game. Toni Duggan and Maria Leon enjoyed the best of the chances to expand on that lead but there was no further scoring before half-time. Barça moved a step closer to the semis when Torrejón converted off a 52nd minute corner, and just two minutes later as good as sealed qualification when Hamraoui heeled in a loose ball in the area. From then on, it was a comfortable ride into an eleventh successive semi-final and Barça could even afford to take some of the regulars off for a rest for the final minutes that with better finishing could have seen the 3-0 lead made even bigger still. Madrid CFF: Ulloa, Agustina, Lucía, Villegas, María del Carmen, Mellado (Laura Ortega, min 65), Alexandra (Irene López, min 74), Analu, Estela (Ainoa, min 65), Silvia Rubio & Bernabé (Beckman, min 82). Barça Femení: Paños, Van der Gragt, María León (Leila Ouahabi, min 65), Melanie, Marta T., Andressa Alves, Aitana, Duggan (Claudia Pina, min 61), Hamraoui (Alexia, min 71), Andonova & Martens (Candela Andújar, min 58). Goals: 0-1, Martens (min 12); 0-2, Marta Torrejón (min 52); 0-3, Kheira Hamraoui (min 54).